Your roommates are freshly home from Thailand and Singapore with jetlags and nasty colds, there’s a fresh new six inches of snow on the ground, and the house is fresh out of most things you’d use for a quick, lazy dinner. What do you do? I went to Jade Mountain and got a ton of work done, then jaunted off to Monona for a thing that was cancelled without any notice. Then I took pity on my roommates and decided to cook them dinner. A quick stop at the grocery store for a few essentials, and then I answered their call for a not-spicy thing with dairy. 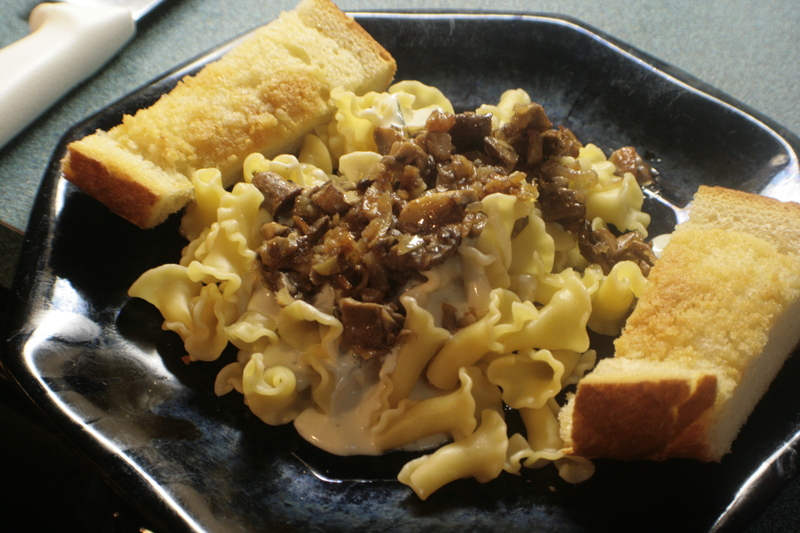 Lazy, quick, and dairy tells me pasta with cream sauce, so I picked up a package of mushrooms, some fresh rosemary, and a loaf of Italian bread. Then, while my roommates napped – “We’re setting the alarm to get us up at six-thirty,” they claimed – I did the ingredient prep. 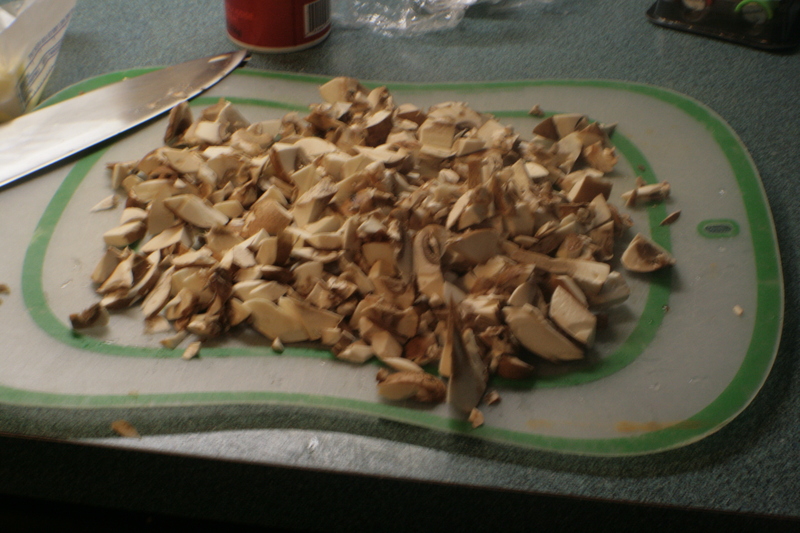 For the record, it’s really, really hard to go wrong by starting a thing with chopping up mushrooms, onion and garlic. Most things you do from there are at least starting with a good idea. 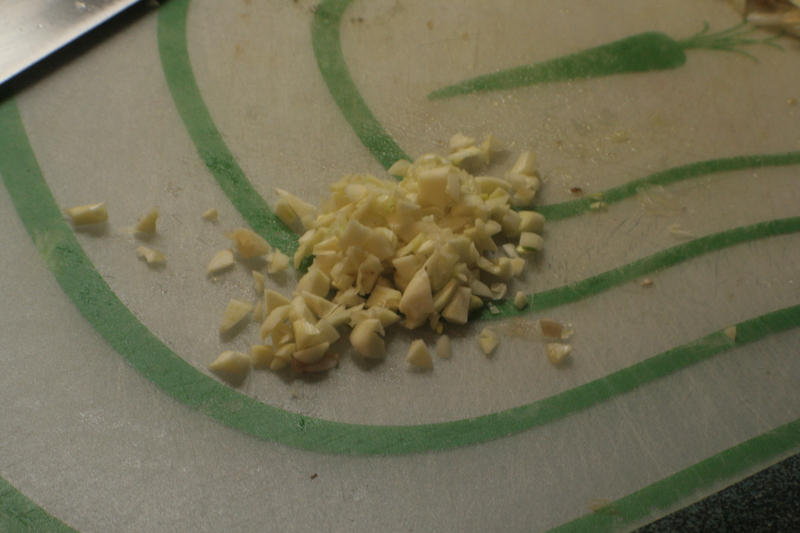 That’s about three cloves of garlic chopped. 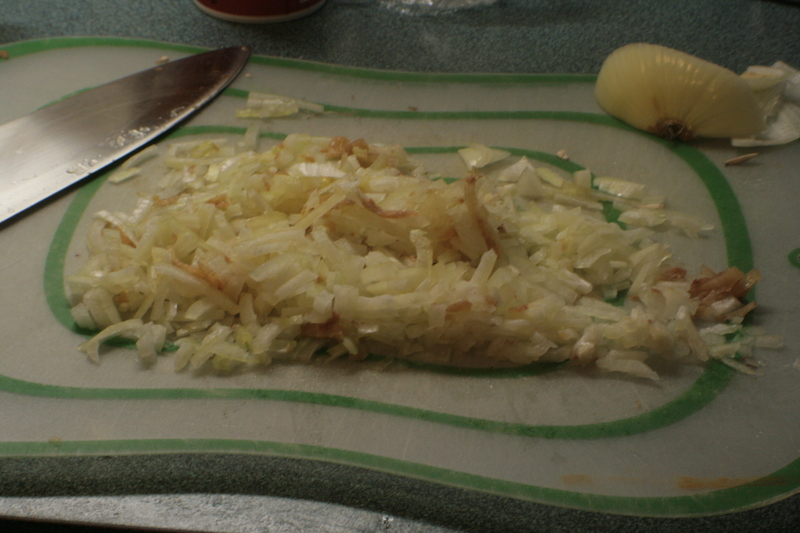 And on this dish, really, the chopping is the hardest part. Have a good knife in your kitchen. Know how to use it. Rapid, tasty dinner will then be yours. I can probably eat my weight in garlic bread, but I decided to be conservative and only use half the loaf. This wound up being a good call – we almost had leftovers. 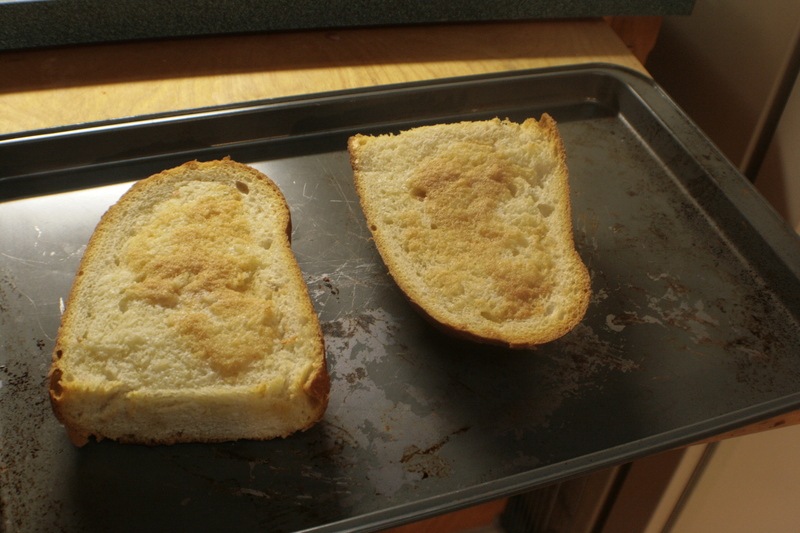 Garlic bread is really easy, too. I just slap as much butter as seems reasonable to me on it, sprinkle powdered garlic over that, then toss it into the oven for about ten minutes to toast and get melty. 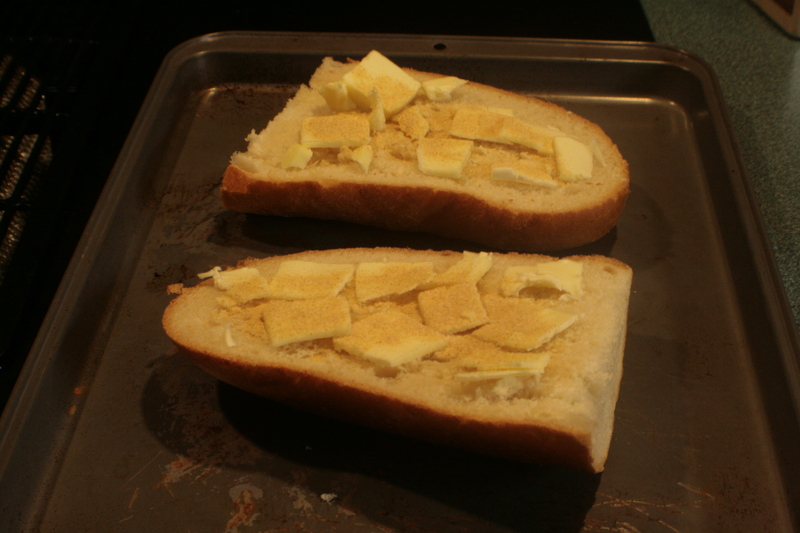 Twice as much butter as is shown here would not have gone amiss, methinks. They got up from their nap a bit after seven, right as I was going to settle down and kill time until they woke up. So I started the sauce. Cream sauce is easy so long as you don’t turn up the heat too high. 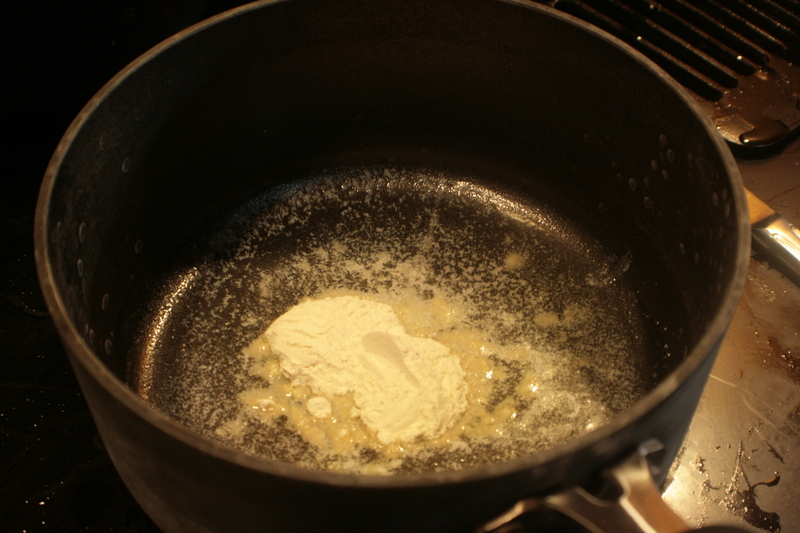 To have enough sauce for three people, I toss a tablespoon of butter into a pan, melt it, then toss in a tablespoon of flour. 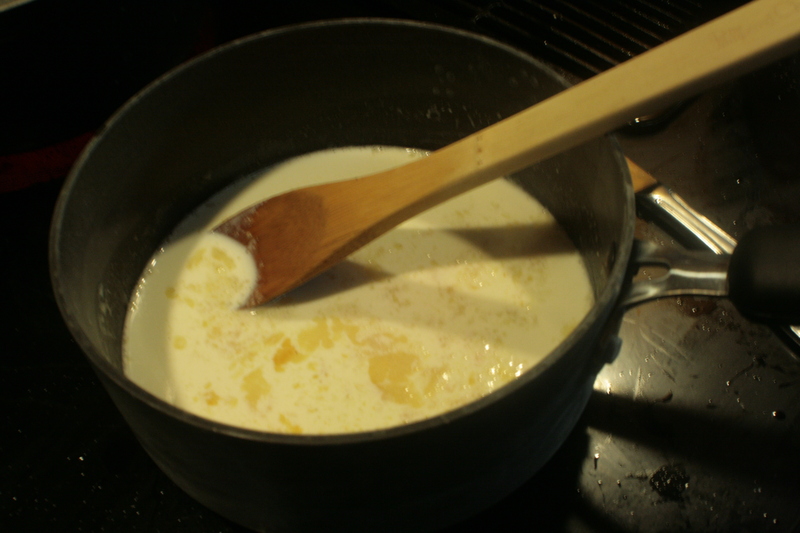 Add a cup of milk and a half cup of cream. I probably should have added a bit more flour up front, but the sauce wound up thickening fine so it was no big deal. At this point I also tossed in some powdered garlic and two sprigs of the rosemary. A bit of pepper would work. No salt needed if you used salted butter. 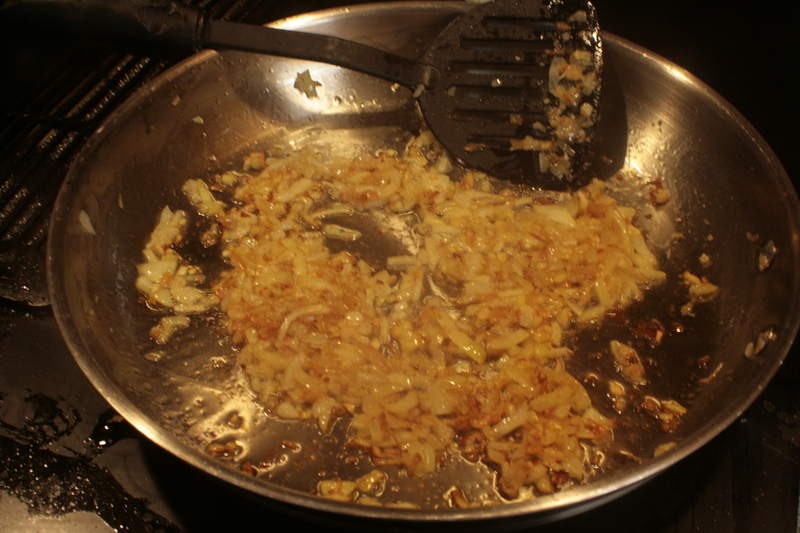 Saute the onions. Yummy, yummy onions. Any oil will do. I used olive oil, because I like it for cooking at these temperatures. If I’m using higher temperatures I tend to go for bacon fat. Then toss in the mushrooms. Mushrooms are a fat hog and will soak up whatever you cook them in. Be mindful and make sure you don’t let them stick to the pan or burn. Once the sauce thickens a bit, it’s time to add cheese. When I do this, I toss in whatever’s in the fridge and looks good. 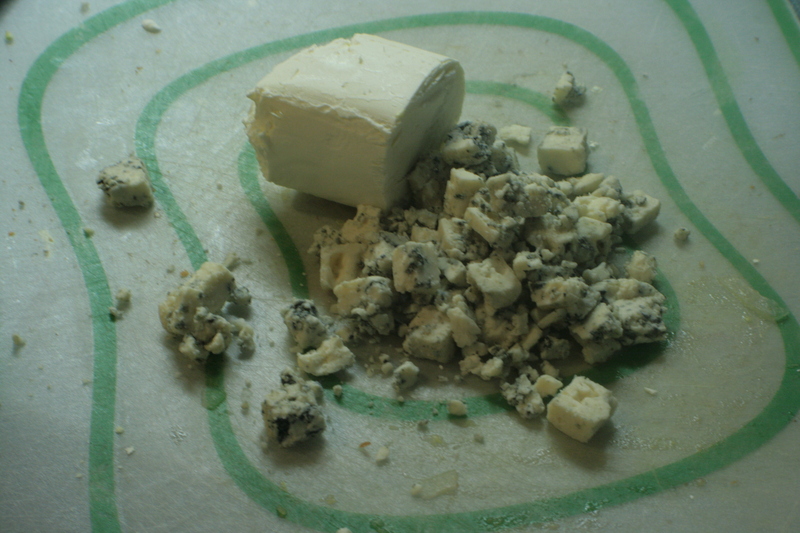 This time around it was goat cheese and gorgonzola. These make a nice combo. We feasted, and my roommates were spoiled.